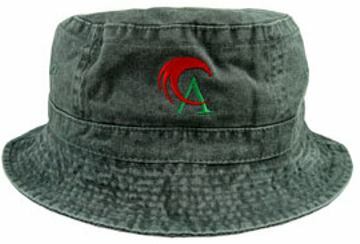 Custom Bucket Hats -Caps in Bulk, Personalized in BulkPromotional, Inexpensive. ON CLEARANCE, REDUCED TO LESS THAN HALF PRICE! Budget Prices in America. Pink, Red, Blue, Black, Khaki, White, Lime Green. Bulk personalized bucket caps on clearance. We also supply blank (not custom printed) bucket caps: see the Price List below. Pigment Dyed Washed Cotton Twill Unstructured Bucket Hats at the lowest prices in USA and Canada . American clients pay no taxes. We will send you a proof for your approval before production. Unit prices below include your 1-color custom imprint. Add $0.40 per cap for each additional imprint color. Blank (Not personalized) pricing = $2.25 per piece. Setup Charge: $52.00 per imprint color. Colors: Khaki Beige, Yellow (the only colors left). Typical Production Time: 5-7 working days after artwork approval; Rush production is available: contact us.